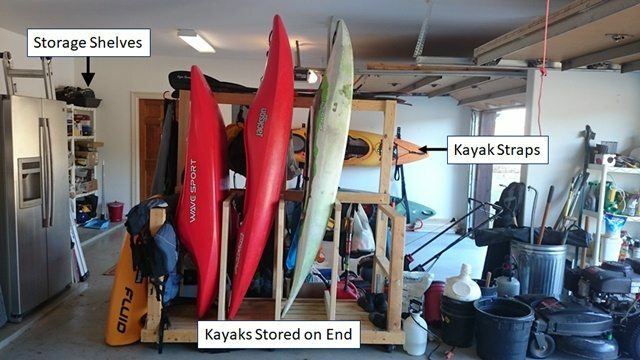 Adventures in Storing Your Kayak Gear By Greg Hansen | DBP MAGAZINE ONLINE The World's Best Free Whitewater Publication. This is what our garage looked like before she got the Traverse. What you cannot see is another Jackson Fun Runner lying on the garage floor. Not only was the garage a mess but it violated a couple of suggestions by thoughtco.com, an educational website, and REI (Recreational Equipment, Inc.). Thoughtco.com says that you should never store a kayak on a hard, flat surface because, “They will develop flat spots and dents in the places where the kayak contacts the ground or hard spot.” I don’t believe that is true. 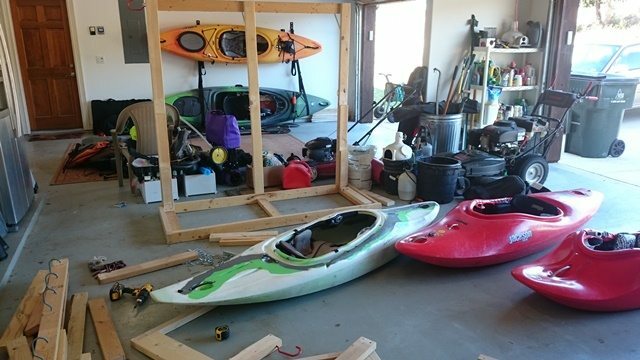 We leave our kayaks on our back deck for days at a time and I have not noticed any flat spots or dents. Maybe that’s because I drag my kayak whenever I can and it is all scratched up. 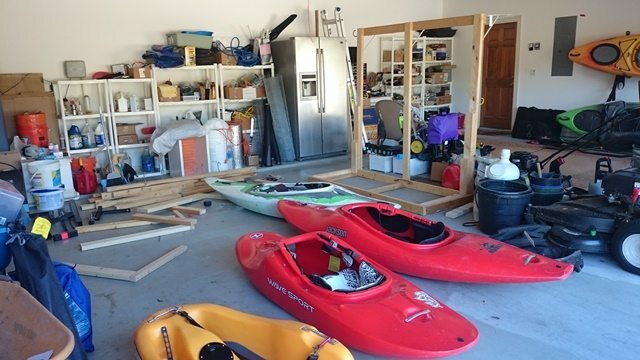 REI says that you should not store your kayaks on end because, “Kayak hulls will deform or bend over time if exposed to uneven weight distribution.” That may be true but, apparently, REI does not always follow its own advice. 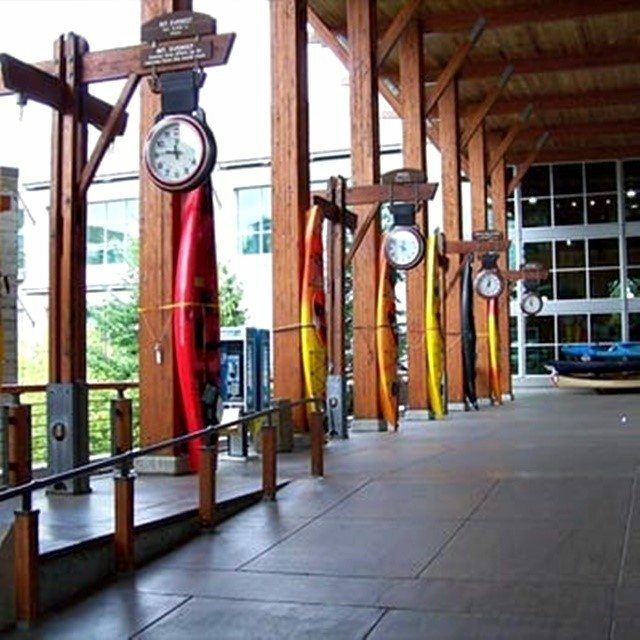 Below is a picture of an REI store in Seattle, Washington. Anyway, the storage method we were using was apparently not correct. Before I go on let me say that the wooden storage rack that I am going to show you was made mostly from wood we had saved from other projects plus a little bit of (non-warped) Home Depot wood, so the cost was minimal. Let me also say that my wife, not me, built this rack as well as the new one. I should have known better than to have rolled my eyes. When she says she is going to do something, she means it. A couple of days after saying she was going to rearrange the garage she had it completely taken apart, had moved all the storage shelves and tool storage cabinet from the back wall to a side wall, and had built a new storage rack, again mostly from saved wood. Here are a couple of pictures of what the garage looked like during the construction phase. It took only about a week before she had two new racks built, one free-standing and one on the back wall. Below is a picture of the free-standing rack without kayaks on it. Below is a picture of the back-wall rack with, of course, the Traverse on it. Notice the shelf on which we can store camping gear and the hooks from which we can hang—whatever. Finally, she added more hooks to the backside of the free-standing rack so we could hang other gear on it. So, is this enough storage space? Not really. 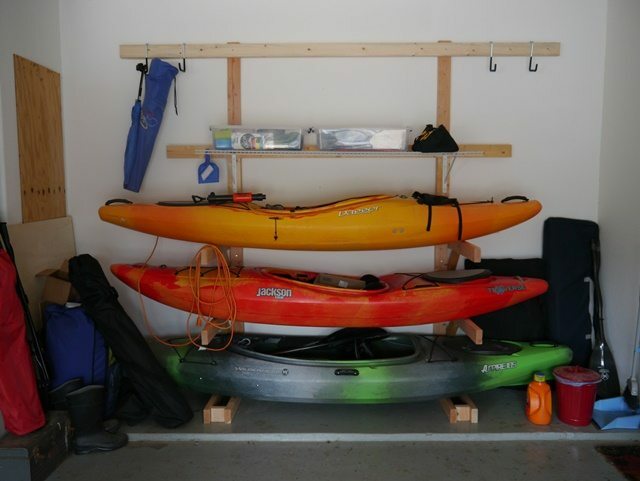 We have helmets, PFDs, booties, etc., stuffed in some of the kayaks. That’s a good thing because thoughtco.com says that, “An open kayak is an invitation for spiders, ants, lizards, snakes, squirrels, chipmunks, and other rodents and bugs to make their home or nest in it.” I know from experience that this is true. I also know that even if you cover the cockpit of your kayak some animal will get into it if it has a mind to do so. Covering the cockpit is good advice but, really, how many of us do that? But how about storing your gear? Thoughtco.com also says, “Keep all your gear together. 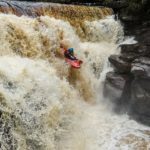 We all know someone who has gotten to the water and realized that they were missing a glove, a bootie, or something more important like a PFD.” I know someone like that—me! This is good advice. REI also says, “Keep your gear dry,” and thoughtco.com adds, “Don’t leave it exposed to the elements.” Both of these are good advice. I once put a spray skirt on my kayak to stretch it out and left the kayak in the Texas summer sun. The spray skirt began to fuse onto the kayak! Note to self—don’t leave your gear in the sun. 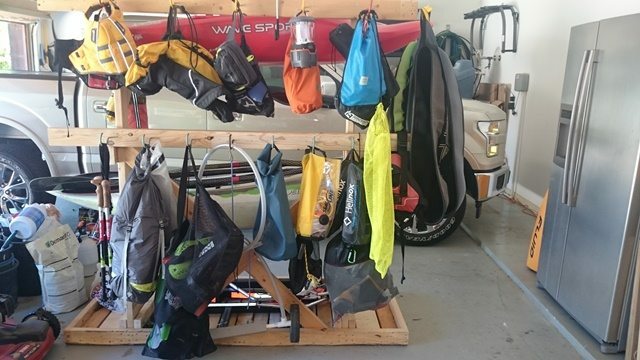 Anyway, sometimes when we get back from kayaking we put our kayaks and gear on our covered back porch and hang up the gear to dry. 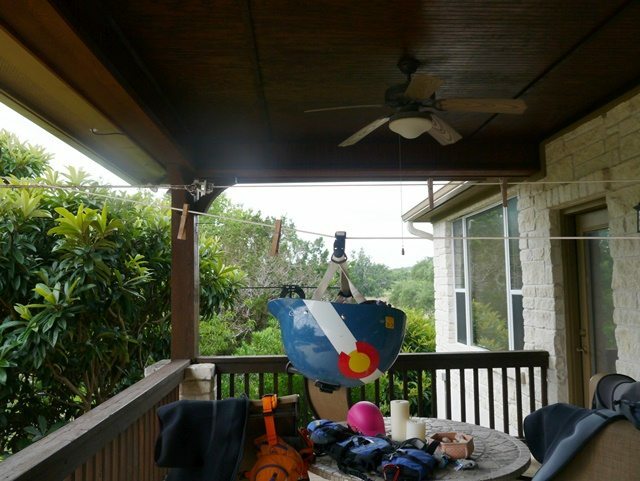 In fact, I always hand my helmet up on a retractable clothes line to let it air out. Good practice, right? Well, like I said earlier, if some animal wants to get into your gear, it will. I left my helmet hanging for two days once and discovered a bird’s nest in it. We have little house wrens around here who can build a complete nest in a day and one apparently thought my helmet was a perfect spot. Fortunately, there were no eggs in it so I could dump it out. But it didn’t end there. One other time we hung a shorty dry top on the line and a wren built a next in one of the sleeves! They are tenacious. Finally, I had a scorpion crawl into one of my booties. Their sting doesn’t hurt that much but they do get your attention. Let’s face it—nature is going to win out every time. Another note to self—keeping your gear dry is great advice, but you have to be sure to keep your eye on it. You never know when you might have come creature living in it.